We love popcorn around here. Jax and I make popcorn at least once a week. He loves to watch the air popper do his thing. We both love the results. Most of the time we just add a little butter and salt. But we were getting ready for a big family get together, so we thought we better do something a bit more exciting than that! Pops loves dreamsicles, so we thought we would do a play on that. Popcorn coated in an hard orange shell then coated in a creamy vanilla coating. Perfect! Place waxed paper in a rimmed baking sheet. Cook the butter and corn syrup in a saucepan over medium heat until the butter is melted. Add the sugar and gelatin, stirring until dissolved. bring to a boil, then reduce heat to low and simmer for 5 minutes. 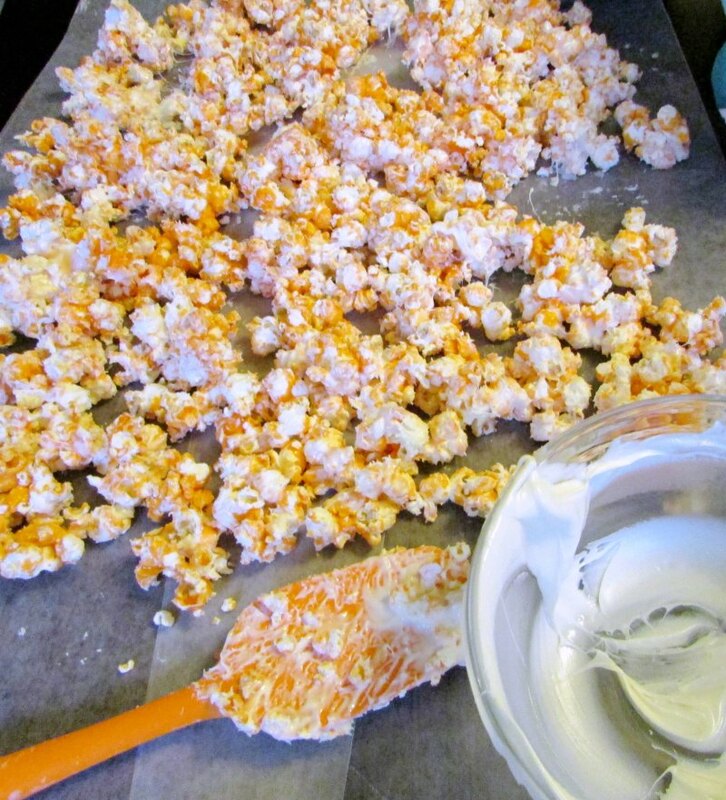 Quickly pour jello mixture over the popcorn and stir to coat. Spread in prepared pan (be careful, it's hot!). Bake for 10 minutes, then cool completely. Place popcorn back in large bowl. Melt the vanilla chips until smooth. Pour over popcorn and quickly stir to coat. Spread back out over waxed paper or parchment and allow to cool until set. Serve immediately or store in a air tight container. Well, if this doesn't sound good, I don't know what does! My son makes lots of popcorn and is always trying new flavors, so I'm sending your link to him. Yummy! Thank you! We love playing with our popcorn too. Most of the time we just have butter and salt, but sometimes you have to really do something fun! How cool is that?! The orange creamsicle sounds like a fantastic flavor. I can also see a lot of different possibilities with this recipe by simply changing out the flavor of gelatin and/or the chips. The possibilities are endless! I can't wait to try more! Wow, Carlee! How yummy does this sound?! 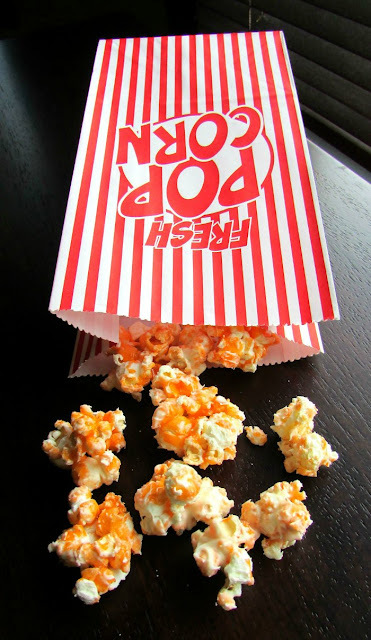 I never thought to use flavored gelatin to coat popcorn with! I'm definitely going to try this for our next family movie night! It sounds like a fun thing for the kids to make too! =) Enjoy your weekend! Thanks, Christine! The gelatin made it easy to get a nice hard candy coating that was brightly colored and flavored all at once! I hope you guys love it. Enjoy yours as well! Carlee, this looks great! I love orange dreamsicle flavor, my kids will absolutely adore this! How yummy does this look!! Thank you so much for linking up at Tasty Tuesday! This post has been pinned on the Tasty Tuesday Pinterest board! I love having you and can't wait to see you next week! Thank you, see you next week! Carlee- I have to try this! YUM! 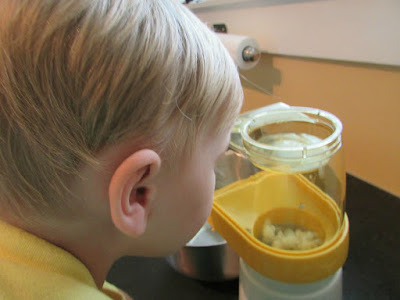 We have the best time experimenting with our popcorn! This one was a lot of fun!